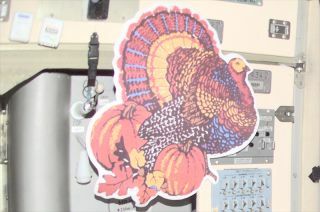 A Thanksgiving decoration, as seen in space in November 2001, on board the International Space Station. From the American frontier to the final frontier, turkey has served as the literal and figurative centerpiece of Thanksgiving celebrations for centuries. NASA astronaut Kevin Ford holds a packet of smoked turkey that will up part of the space station crew's Thanksgiving feast on Nov. 22, 2012. "We will have a little Thanksgiving feast onboard," NASA astronaut and Expedition 34 commander Kevin Ford said Tuesday (Nov. 20) from on board the International Space Station (ISS). "We have some smoked turkey, of course, to celebrate the holiday." Thermostabilized turkey and freeze-dried stuffing are on the menu for the U.S. astronaut and his two cosmonaut crewmates, Evgeny Tarelkin and Oleg Novitskiy. "Thanksgiving isn't a holiday that the Russians celebrate, but we've found that on orbit, the crew members celebrate each others' holidays," Vickie Kloeris, the manager of the Space Food Systems Lab at Johnson Space Center in Houston, told SPACE.com. "They will take part in Kevin Ford's celebration of Thanksgiving, just as American crew members will take part in some of the Russian holidays." The first astronauts to spend "Turkey Day" in space did so aboard Skylab, the United States' first space station. The Skylab 3 (SL-4) crew of Jerry Carr, Bill Pogue and Ed Gibson arrived aboard the orbiting workshop just six days before Thanksgiving on Nov. 22, 1973. Unlike most federal employees, the NASA astronauts did not have the holiday off. Gibson and Pogue performed a six and a half hour spacewalk that Thursday, floating like a pair of Thanksgiving Day parade balloons, replacing film cartridges and repairing an antenna outside the station. In the process of completing the repair, Pogue ripped into an aluminum-coated plastic blanket to gain access to an electronics box. The blanket's scraps, liberated from the station, sparkled in the glint of the setting sun. "While we had our turkey that evening, we were able to look out the window and see the twinkling tinsel of our unintentional Christmas decorations," Pogue later wrote in his book, "How Do You Go to the Bathroom in Space?" Members of the STS-129 crew share a meal while on the space station. The scene on Thanksgiving day will be similar onboard space shuttle Atlantis. The first and final missions to land men on the moon, Apollo 11 in July 1969 and Apollo 17 in December 1972, both had "Turkey and Gravy" on their crew menus (as did the missions that came between them). But the fowl food wasn't the only type of Turkey aboard the historic flights. The missions, led by Neil Armstrong and Eugene Cernan respectively, also flew the flag of the Republic of Turkey. The red banner with its white star and crescent moon was part of the flights' flag kits, which held a colorful collection of state and country flags for post-flight presentation. Similar flag kits were aboard the other Apollo flights, but Apollo 11's and Apollo 17's flags stand out for what they accompanied. After the missions returned to Earth, small samples of lunar material were encased in acrylic buttons, mounted to a wooden plaque and, with the flown flag of the nation, presented on behalf of the United States to the public of that country. Turkey's Apollo 17 "goodwill" moon rock and flag that was flown to the moon is exhibited at the Mineral Research and Exploration (MTA) Natural History Museum in Ankara. The location of the country's Apollo 11-returned "goodwill" lunar sample display is currently unknown. The first mission to orbit the moon had turkey packed on board without the knowledge of the crew. Though the flight coincided with another holiday, the astronauts gave their thanks for the festive meal. Arriving around the moon on Christmas Eve 1968, Apollo 8's commander Frank Borman had just finished lamenting to Mission Control about the freeze-dried holiday dinners he and his crewmates, James Lovell and Bill Anders, had aboard, when the three found the surprise meal waiting for them. "In Apollo 8's food locker, wrapped in foil and tied with red and green ribbons: real turkey with stuffing and cranberry sauce," historian Andrew Chaikin wrote in his 1994 book, "A Man on the Moon." The "wetpack" meal, developed by the military, was "by far the best meal of the voyage."